Sorry folks, this is what a recession looks like in China since the big guys are unable to go broke. Maybe they need to send everyone back to the farm for six months to provide a super boost there in human effort. This means we face an economic pause here while demand has a chance to pick up and clean up inventories. In the mean time the US economy is staggering back onto its feet but remains slow going. The Euro zone remains trapped in a caccoon of poor investor confidence that is still far from been resolved. All these economies would respond extremely well to anything that assists in recapitalizing the base itself. Perhaps this time instead of the usual stupidity, we could provide stimulus money by simply correcting the mortgage rules and matching down payment money for new house sales. If that were done universally, the capital formation would be rapid everywhere and demand would soar. The funds could be secured a claim paid out on resale at double original face value. 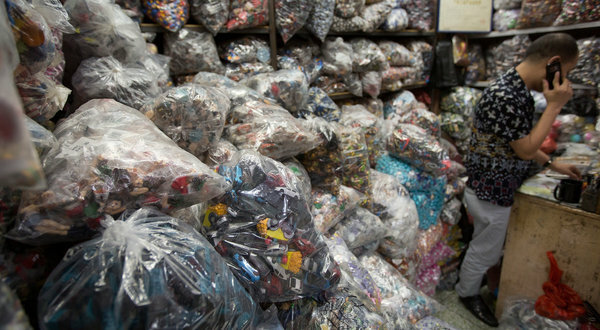 Bags of toys stored at a shop in a wholesale market in Guangzhou, a city in southeast China. Corporate hiring has slowed, and jobs are becoming less plentiful. Chinese exports, a mainstay of the economy for the last three decades, have almost stopped growing. Imports have also stalled, particularly for raw materials like iron ore for steel making, as industrialists have lost confidence that they will be able to sell if they keep factories running. Real estate prices have slid, although there have been hints that they might have bottomed out in July, and money has been leaving the country through legal and illegal channels.